I am sure you all said yes. Everything we see today has been digitally enhanced. Every face we see is not only cleaned up, but necks are trimmed, the chins are tucked, and eyes are enlarged. Every blemish from the skin is erased, hair is made more glimmery, all this on top of picking the prettiest of models (see Dove Video). It is no wonder media has such a negative influence on the way children perceive themselves and their own self-image. But what about the days before photoshop even existed? What about the photos we see in our history books from the 1800s? Did you know they too were doctored and modified? Did you know Pulitzer winning photos that are now etched into history as the image of some historical event were also modified? Did you know political leaders like Lenin and Hitler frequently modified their photographs to remove people they did not want associated with them? Did you know many of the celebrity pictures you might have seen in magazine is the celebrities HEAD on a different person’s body (See Oprah & Martha Stewart Below!)? Times came out with a list of famous pictures that were manipulated. See some examples below. This is a picture of the civil war generals which we find in many of our history textbooks. It was taken by Matthew Brady, regarded as the world’s first commercially successful photojournalist. Great picture. Great lineup of Generals, yet the problem is not all these men were present when the pictures were taken. A Commander named Blaire was added to the far right after the fact. See Below. Lenin Addresses the Troops 1920 – Alone? or Not Alone? This is a famous picture of Lenin addressing his Red Army as they prepare to go to the Polish front during the Russian Revolution. What we, as well as the Russians who saw these inspiring pictures, is that fellow Central Committee members were also present. Leon Trotsky stands on the right of the podium and Lev Kamenev who is behind him. Though they were part of this turning point in history, they were removed because Stalin saw them as threats to his power. They were purged and their contributions slowly removed from the historical records. See the two men below. Oprah, one the most well known celebrities of our time has graced many magazine covers. However in this TV Guide she is seen in a beautiful dress sitting on a pile of cash. You see it? The pile of cash is so fake right? You are right. See anything else? Take a look at the picture below. That’s not Oprah’s body. It’s Ann-Margaret. Still don’t believe that everything you see in media is manipulated and photoshopped? For your enjoyment. 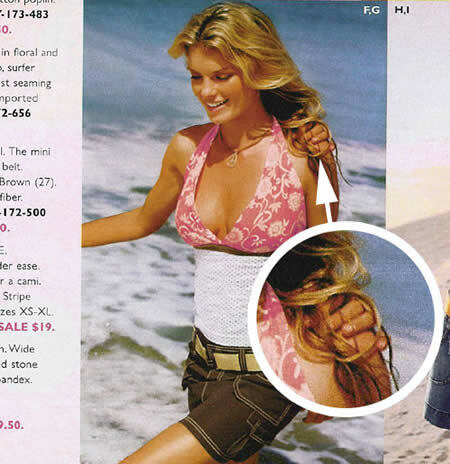 See some horrific photoshop mistakes below. Uh… something is not right. I am not going to comment on this one. There is no way I can win. No one wants to see the guy with Jessica Simpson. Photos like these are the reason why some countries have attempted to curb the manipulation of images in advertising. Others have gone vigilante by highlighting photoshop as a means to creating such perfect photos. There are tons of such pictures out there. Perhaps I’ll post some for everyone’s enjoyment in the future. Do you believe the images you see in media are mostly altered or manipulated? Do you think the “beautifying” of people in magazines, photos and billboards have an impact in the way young boys and girls view themselves? Which of the top 10 pictures + 3 photoshop mistakes above is the most shocking? Most funny? Let us know! Comment below. that hand on her shoulder is so scaryyyy. wow, i didnt know that they could edit photos so well in the past, and no photoshop either! Hello, these images are very eye-opening. I am doing a project on body image and the media’s influence. May I have your permission to use these photographs? Christine – yes some of these photoshop manipulations are creepy. really dont think thats suppose to be a manipulation of the image. body? shes not famous, its just a cereal box. picture, they wanted to highlight the girl’s cloth and nothing else. I am doing a Film and Tv Project for University would you mind if I included your website and information in my documentary? Your friendly earth friend Andy. as long as the site is.. cited 🙂 .. you can reference the any information here. Those are very interesting, but the Lenin one is not necessarily a manipulated photo, they may be two different photos. if you look closely at the subjects at the bottom, you can clearly see that you have the same people, but they have all moved. maybe the second one was taken before Trotski arrived or taken after he had moved. The one with Lenin made be incorrect. You can clearly tell the two pictures are from different angles at different moments in time, as a face or two in one shot are turned more toward the camera than in the other. They may have cut out the two men in question, but it is also possible the two men left or had not arrived during the alternate photo. Hi laughing when I say that last image of Jessica Simpson. That’s the power of Photoshop. Those were some funny. The more fun part is that the identity of the person who edited the person remains a secret and the photo becomes a joke. This shows the power of Photoshop. One does not simply learns and manipulates images. He/She requires great attention and should be able to read the details. If not, then this happens. Haha,error while processing your photos using Photoshop ! I’m a preschool teacher and I want to do a superhero theme. I want to Photoshop a student’s picture into a superwoman or superman’s body and a magazine cover. I know how to take their picture but I don’t know how to photoshoot it. Can you please tell me how?